Midas Golden Touch slot by Thunderkick huge big win potential! 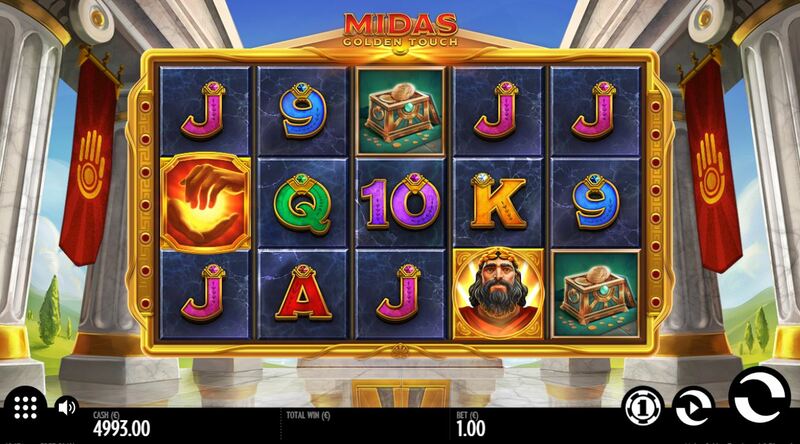 Midas Golden Touch slot by Thunderkick is a basic yet exciting game with some very big potential wins. The theme is naturally centred around he whose touch turns things to gold so the reels are surrounded by gold and lie over a beautiful Greek temple with soothing classical music to complete the ambience. 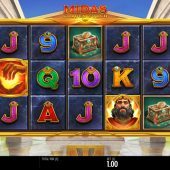 Midas has been seen a few times before with Midas Millions and Age of The Gods Mighty Midas plus Nextgen even created a female Midas with their Miss Midas slot to champion a bit of gender equality. So will Midas's golden touch be extended to our bankroll here? Midas Golden Touch slot offers us 15 fixed pay lines over 5 reels of 3 rows each and all symbols bar the scatter can appear single or double-stacked. There 5-of-a-kind pays are quite high as you'd expect from a 15 line game and can get very high but we'll get to that soon. For now the Wild in the form of hands clasping gold pays 75x bet as does King Midas, then the Leaf Necklace 25x, Goblet 20x and Chest 15x. There are six card values paying from 7.5 down to 5x for a full line of 5. The Wilds will multiply any pay according to how many appear on the line. So a full line of the top Midas icon at 75x bet for 5OAK with 4 Wilds will be multiplied 16x for an incredible 1200x win per line - remember the symbols can appear 2 rows high so technically it's feasible to get more than one line of this, although I believe in the base game only one 2-row stacked Wild can appear on any spin. This isn't the case in the bonus though! If you see 3,4 or 5 Pillar Scatters appear anywhere in view, 10,15 or 20 free games are awarded which can be retriggered. The enhancements are twofold - firstly you get a Wild placed on the grid on every spin and secondly any win is held and non-winning positions respun until no further value is added to the combination present. This is the same format that Jack Hammer and other slots use in their base game. If you land more Wilds in the respun positions (and they seem more frequent in the bonus) then some big totals will rack up even with lower symbols. Thunderkick tell us up to 10,100x bet can be won, although they fail to say how and I cannot work it out with any certainty!